This map presents a landslide inventory for the Ferron Creek area, Sanpete and Emery Counties, Utah, at a scale of 1:24,000. 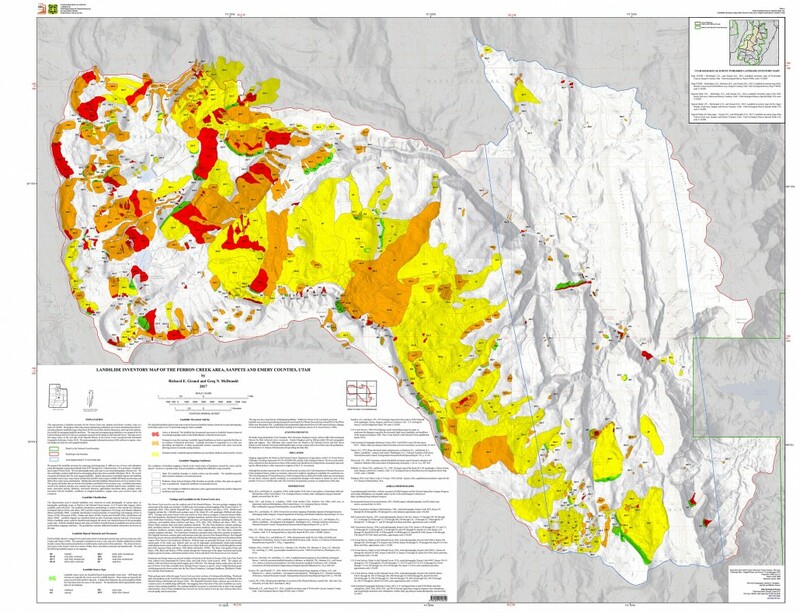 The purposes of the map and accompanying geodatabase are to show and characterize landslides areas and to provide information useful for managing landslide-related issues. Spatial and tabular data for each landslide are stored in the geodatabase and linked to the inventory map. Landslide information in the geodatabase includes: area, material type, movement type, landslide deposit name, landslide source name, movement activity, thickness, movement direction, approximate movement dates, geologic unit associated with landsliding, confidence in mapped boundaries, mapper, peer reviewer, and general comments.